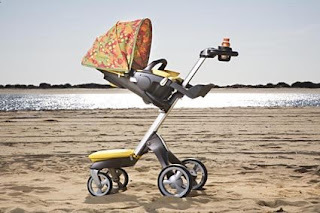 Mummy-Tips: Is this the best looking pushchair ever? Is this the best looking pushchair ever? I know that I have historically suffered from an addiction to pushchairs and now that my youngest no longer requires me to push her around (all be it in state of the art wheels) it is with deep sadness that I don't get to own one of these fantastic new Stokke Xplory's. Looking firmly ahead to spring - they have launched two new accessories kits in the aptly named Forest patterns. I saw pics of them a couple of weeks ago but I was lucky enough to see one in the flesh yesterday and they are quite simply stunning. The kits are a great idea. You can give your Xplory an update without breaking the bank. For around £100 you get a hood, diaper wallet, bottle bag and footmuff. Can't decide which colour? Buy them both! If you want to have a bit of a play around with how the colours look, check out their new Xplory moods page and customise to your hearts content!